A hotel room with a view. 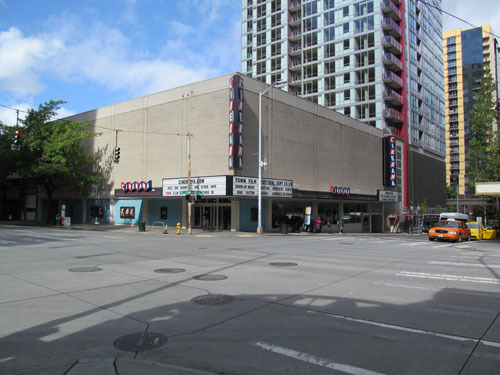 During the 1950s and '60s when Cinerama was at its top popularity, it would have been virtually impossible to travel the world and visit all the 3-strip Cinerama theaters. There were hundreds of them. Today there are only three left, not counting one or two private facilities that are not open to the public. I had already visited Bradford and Los Angeles (Hollywood), and the only one remaining was Seattle. 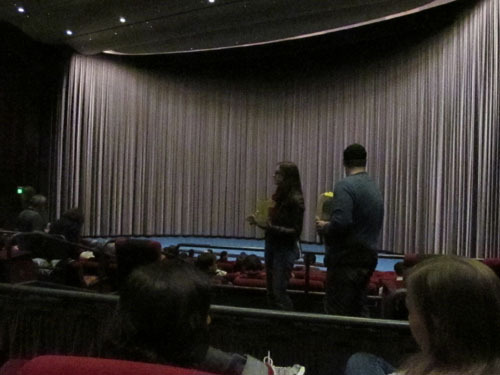 This year (2013) I got the chance to go there, to make my "collection" of current day Cinerama cinemas complete. The Cinerama movie theater in Seattle is perhaps the most convenient of the three to reach by plane. From the airport it's only a 35 minutes train ride to downtown Seattle. Walk north a couple of blocks from Westlake Station, and you're there. It's also very easy to find somewhere to stay. There are lots of good hotels within walking distance. 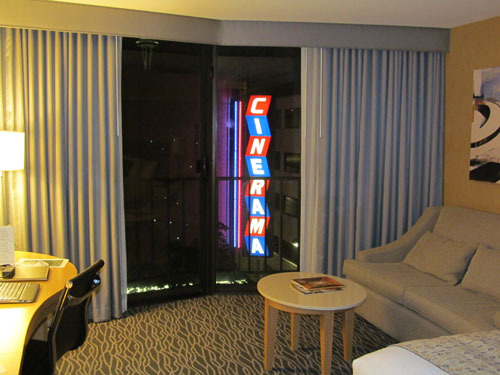 I stayed at The Warwick Hotel which is so close to the cinema that it's almost too good to be true. The theater itself is pretty ugly on the outside. The building looks just like a big, over-sized box. Once you're inside, it gets better. It's not remarkably beautiful, but it's functional, and the seats are comfortable. 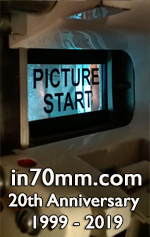 The Big Screen 70MM Film Festival is not an annual event. It's arranged with some irregularity, slightly at random it seems. The last time was two years ago. Compared to other festivals, it's a pretty basic event. They take a selection of 70mm and Cinerama films and run them straight through without any special fanfare. There are no introductions, no lectures, no guest artists, no program booklets, no souvenirs, no surprises, only the movies and an awful lot of popcorn. With that in mind, it shouldn't come as a surprise that the audience is 99% locals. The entire festival ran for 2½ weeks, but I only stayed for the final week. More wasn't needed since most movies were shown at least twice. With only one or two movies a day on the program, it was essential to find other things to see and do. Luckily, the town offers many tourist attractions and many great eateries and cafes. Starbucks has its headquarters here, so there's a Starbucks at almost every street corner. On the very first day I met Matt Lutthans who spared no effort during the week to make sure that I had a good time in Seattle. Matt is well-known amongst Cinerama fans. Some 15 years ago, he formed The Cinerama Society of Seattle and campaigned for saving the cinema when it was threatened by demolition. Billionaire Paul G. Allen (one of Microsoft's founders) heard of the effort, bought the theater and had it refurbished. The 70mm program started with a few of my favorite movies: Baraka, 2001: A Space Odyssey, Vertigo, and The Sound of Music, and one not so favorite - Patton. I had to skip Lawrence of Arabia to take care of my jetlag. Just like in Bradford, the theater has two screens, one "flat" (which isn't really flat, but slightly curved) for regular films and a deeply curved Cinerama-screen. But unlike Bradford, where you just press a button, it's a complicated and time-consuming procedure to switch between the two. I expected the 70mm films to be shown on the flat screen, but to my delight, everything was projected on the curve. The Cinerama Theatre as seen from my hotel room. 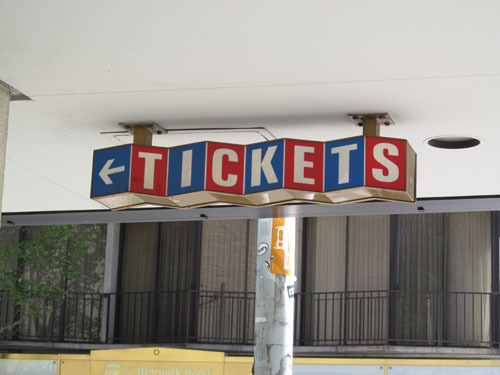 Most of the 70mm movies looked great on the Cinerama-screen reaching all the way down to the floor, but it should be noted that even though the screen is "louvered" (made up of a number of vertical stripes), the louvers are angled incorrectly so that they do not cancel out any cross reflections. A single sheet screen would have worked better. As it looks now, you get all the disadvantages of the louvered screen but none of its benefits. The main projection booth is quite small considering that it must hold two regular 35/70mm projectors, one digital projector and the center ("Baker") Cinerama projector. They solved it by putting the projectors on rails so that you can move one machine at a time up to the projection window. 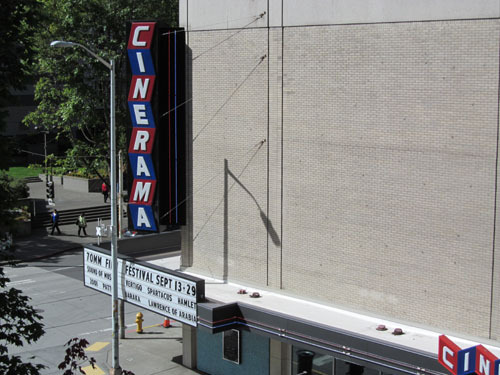 In addition, there are two more booths for the Cinerama side projectors. Approximately 10 minutes before the intermission, 2001: A Space Odyssey was interrupted, and the house lights came on. Apparently a member of the audience had fallen ill, so an ambulance must be called. The paramedics arrived within minutes and took him to the hospital. We were told that he had been well taken care of before the show could eventually continue. Then the projectionist did something very rare and commendable. He rewound a few minutes and restarted the reel so that the audience wouldn't have to miss anything. The festival came to its conclusion with two movies in true three-projector Cinerama: How the West Was Won and This is Cinerama. To me, they were the highlight of the festival, but I regret to say that the screenings weren’t perfect. In addition to the cross reflection problem, there were some serious focusing issues with the Able and Charlie projectors. Cinerama should be razor sharp, but in this case it was not. Also, This is Cinerama had a very noisy soundtrack. There are only three places in the world where you can see real three-projector Cinerama, and Seattle has the potential to become the very best of them. The festival deserves better than to be just a local matter for the people who live here. Like its "siblings" in Bradford and Los Angeles, the cinema should be able to attract fans from all over the world. And I think it might, with some proper marketing, associated events, and attention to the technical shortcomings.